Our new publication "Childrens Career Choices” is now ready and available for primary students. It is 16 pages, in full colour, note-size (like The Career Key)and with a hard cover. This publication will help you to infuse career guidance information smoothly into the primary curriculum in a fun, interesting and activity-filled way. 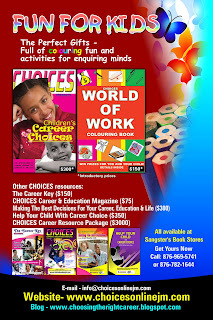 Children’s Career Choices is the perfect partner to The CHOICES World of Work Colouring Book for primary and pre-primary students and The Children’s Career Key (Caribbean edition) - soon to be available - for 5th and 6th graders. Please call us with an order if you are interested in receiving copies of any of these publications.